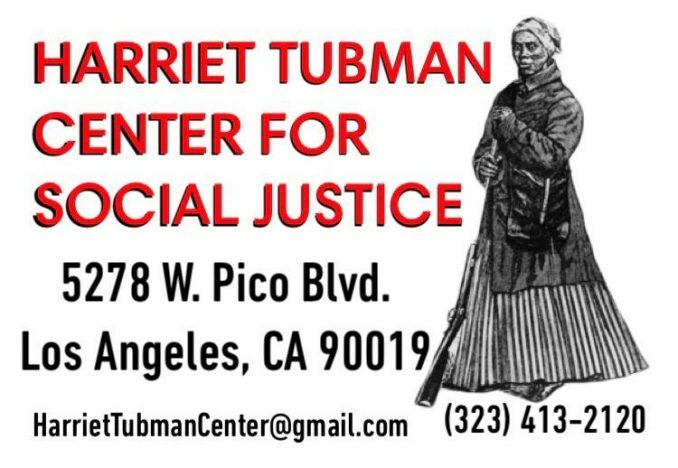 The Harriet Tubman Center for Social Justice is a hub for progressive activists in Southern California. Located in Los Angeles, on Pico Boulevard between Fairfax and La Brea, the Center hosts the Los Angeles branches of Workers World Party, the International Action Center, FIRE (Fighting for Im/migrants and Refugees Everywhere) and the Prisoner’s Solidarity Committee. Radio Justice LA (radiojustice.org), a progressive podcast radio network in the center of the local movement, is also at home at the Center. Various organizations at the forefront of the struggle, including BAYAN, CISPES, Unión del Barrio and #MeToo International have hosted events here. When WWP member John Parker ran as a Socialist for the California Senate on the Peace and Freedom Party ticket, the Center served as his campaign office. That revolutionary political campaign exposed the phony elections of the ruling class, as well as the failure of the capitalist system for refusing to provide basic human rights like jobs, housing, clean water, clean air, health care and education. The Center welcomes all those committed to fighting racism, sexism, cis-sexism, heterosexism, ableism, anti-im/migrant bigotry, U.S. imperialist wars, capitalist exploitation and all other forms of oppression. Because of the Center’s contributions to the struggle, reactionary forces and the state have made it a target. Recently, a forum there on Syria was hosted by the International Action Center to educate on U.S. and Israeli imperialist aggression in the region. In a vile attack, imperialist stooges chalked propaganda supporting U.S.-NATO aggression on the Center’s walls and taped flyers promoting the same lies across its window. During the lead up to a September week of action in solidarity with the people of Puerto Rico, the Center was targeted by unidentified right-wingers who ripped down, shredded and defaced many flyers posted in the community to publicize solidarity events. Despite these attempts to stop the Center’s organizing, the culminating Sept. 27 Puerto Rico event was a tremendous success. The evening started with the playing of a taped speech by Puerto Rican independence leader Pedro Albizu Campos, given in the 1950s. Educational videos and a Press TV documentary on U.S. colonialism in Puerto Rico and the island’s independence struggle were screened, and a very comprehensive and insightful anti-colonial discussion followed. The Center will not be intimidated by attempts at repression. We will continue to stand in solidarity with the people of Syria. We will continue to stand in solidarity with the Puerto Rican people and fight the injustice of U.S. colonial crimes. This is not the first time these types of attacks on the Center have occurred. For instance, reactionaries opposed to reunification and peace on the Korean Peninsula have held demonstrations to oppose the organizing efforts of the Los Angeles International Action Center, based at the Center. The answer to these attacks is to continue and increase this very important work. The Center welcomes solidarity with its fightback against fascists, to counter trumped-up charges from the state on Center-affiliated organizers related to an action shutting down an ICE detention center, and to oppose the injustice of the U.S. imperialist, settler-colonial, capitalist system. The Harriet Tubman Center is launching a fundraiser campaign to help support costs of current organizing and prepare for future actions. One-time donations of any amount are welcome. as well as continuing contributions, on Venmo @HarrietTubmanCenterLA. If you are in the Los Angeles area, the Center invites you to visit or volunteer to join the struggle. When you dare to struggle, you dare to win. 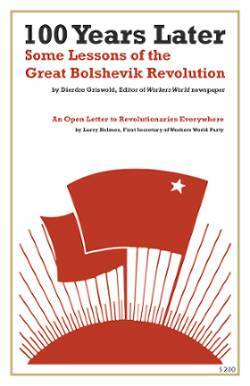 Power to workers and oppressed peoples!